…for all-around general wear, and to keep the top of my head from getting too cold or too sunburned. A baseball cap, specifically. I’ve considered other styles, but all have their shortcomings. A fedora or trilby or pork-pie demands more global wardrobe changes. An Irish wool cap might be fine, except my son wears one. Golf, hunting, and fishing styles are pointlessly ironic. A cowboy hat? Not even on Halloween. And so a baseball cap it is. In fact, right now I have four in rotation, but none of them are quite right. A Philadelphia Phillies cap invites too many comments, from random taunts from Mets fans to overly specific questions I can’t answer (“Why’d they take out Halladay with a two-run lead two nights ago?”). 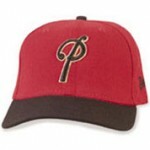 A Pittsburgh Pirates cap evokes pitying looks and wisecracks about that 18th straight losing season. I was ok with that until I recently read a convincing article about how the team does better financially by fielding a minor-league caliber team. Now I’m disillusioned by MLB in general – you can’t just blame the Yankees and Red Sox for driving the competitive imbalances. I have what I thought was a sufficiently inconspicuous Florida Gators hat – just a simple capital F, an underappreciated letter, but still, you get people who want to ramble about the SEC standings. And finally, my UAlbany cap, which never draws any comments but has a big cartoon dog on it. My local team is the Tri-City Valley Cats, which, try as I might, I can’t get fully behind, both because of the meaningless geographical referent (in 11 years here, I’ve never heard the term “Tri-City” used by anyone, even in reference to this team) and the meaningless nickname which further embeds a meaningless geographical referent (if they’re referring to being it the Hudson Valley, that really describes a region to the south, where another team in the league called the Hudson Valley Renegades may be found). Even so, their VC caps aren’t bad, but could just as easily be read as CV, which reminds me of Curriculum Vitae, or CVS drug stores. What I’m really looking for is something minor-league, or international, or small-college, with a nice inconspicuous initial, like F or V or K or Y, in a tasteful font, with no teeth-baring cartoon characters, that signifies nothing at all to nearly everyone, but if someone DID recognize it, then a good conversation would likely ensue. Something a bit secretive, that points to those places in America that you mostly only hear about when there’s been a flood. Here are some illustrative examples. The New Britain Rock Cats are a typical example of a minor league team with a meaningless nickname and inescapable cartoon character. 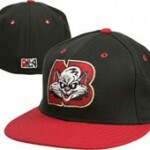 The Portland Beavers cap comes very close to what I’m after, but it’s the wrong region of the country. If it was Portland, ME, I’d take it in a second. 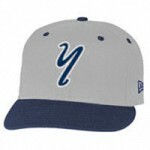 Likewise, the Staten Island Yankees cap is just about perfect, except they’re the hated Yankees: not a chance. Plus you don’t want anyone to think you’re with the Viet Cong. Um, any Albany Senators throwback caps up there? Sometime you should just give me your phone number and I can ask you things directly. I looked briefly at several sites, Kent State, Cyclones and Iron Pigs. Yikes there were some ugly hats. It seems they are trying to tap the Nascar hat wearing market. There weren’t too many hats that were logoless on the brims for some reason. Who knows? Just give in and get something like this. I’ve spent an hour searching though caps, and I’ve come up with three designs i like- 1938 Osaka Tigers, The Pittsburgh Keystones, and Boise State. If one is to believe in this BS post-racial stuff, I say go for the Keystones. What’s the cognitive dissonance about an obscure team of years past? Wiggas are where it’s at anyways. The BSU hat i saw, w/o Bronco, walks the line between current significance, anti-nostalgia, and ‘who in fact really cares about them’. Plus you’d probably be safe within your racial barrier. Idaho’s association with neo-nazism is fairly well-known. The Tigers seem to be the balance here, juggling the yin yang. I have difficulties with a predominately white hat, but pinstipes are renowned, and kind of hints toward a trusty train conductor. Years ago, John bought me a baby-blue Phillies cap. I wasn’t aware they even made such things. It could be a function of being out west, but no one ever made any phillies comments when i was wearing it. Perhaps too nonsensical for your taste, Frank. John got an old school angels cap, but the embroidered halo looked like he was wearing a yarmulke, so perhaps that’s not in order either. The Doosan Bears! Frank, the big D can stand for “Dad”. Some great suggestions here. Albany Senators merchandise seems to be nonexistent. Surprisingly, so does Philadelphia A’s, which at one time would have put it into the public domain. Probably not anymore. Some of the Phillies throwbacks look good, and I actually like the Brooklyn Cyclones logo with the Brooklyn Dodgers B and a tasteful intersecting C. The Boise State B and Doosan Bears D are intriguing in the same way. I’m not locating any 1938 Osaka Tigers but the current Hanshin Tigers (and Yomiuri Giants, for that matter) are ok.
I’ve also learned you can order a custom cap with any letter and font you want at lids.com. Good to know we’ve collectively (possibly) solved the balding pate problem. ack….. a misplacing small objects syndrome moment (too often)….. 1936! Have enjoyed the the last 2 Sports related posts. Maybe an idea like….hmmmm…write about sports once a week…. or ….hmmmm ….entertainment!? Sports and entertainment, not there’s any need for a conjunction like ‘and.’ Granted entertainment usually means tv, theater, movies, boardgames, John Tesh….still c’mon, an expert has to be within us to to put a perceptive pen to this week’s TV premieres. Or how about your local high school’s football game? Though it won’t be as entertaining as ‘Friday Night Lights’, at least you can go gnaw, speaking from personal experience, on a corn dog with good company. Frank, any new hats in da house?